Welcome to It Only Takes E Minute, where a red flag delay isn't enough to dampen a great race. A lengthy red flag period followed as the FIA cleared the track and then tried to decide how best to restart the race. Eventually the action got going again, and Sam Bird moved into the lead, from where he never looked back. 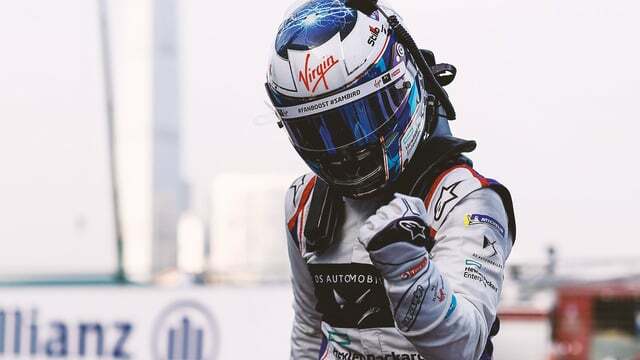 Even with a dodgy pit stop where he missed the garage, knocked over some equipment, earned and served a drive through penalty, he stayed ahead and took the chequered flag. Vergne followed for second, holding off a furious Nick Heidfeld who questioned the Frenchman's defending and blocking techniques. Elsewhere, Jérôme D'Ambrosio was in and out of the pit lane after picking up car trouble, Buemi and Di Grassi finished outside the top ten after an early collision, and Mario Engel finished an impressive fourth after a tough fight but was demoted to 14th after a post-race time penalty for exceeding max power.